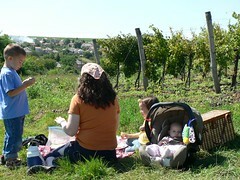 Above: On Saturday, we ventured out for family picnic in the hills of Szücsi. 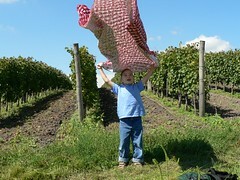 Above L: Ben prepping the blanket in the cool summer breeze. Above R: Sipping on lemonade and munching on ham and cheese sandwiches. 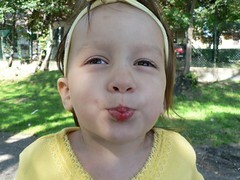 Above L: Elianna with the aftermath of delicious ice-cream on her lips. Above R: After a treat, we headed for the open field where Ben launched his sling shot airplane and Ellie practiced her softball swing. This morning I was able to meet with DezsÅ‘ for our ongoing discipleship. We continued on the topic of the church and discussed the roles of leaders in the church. 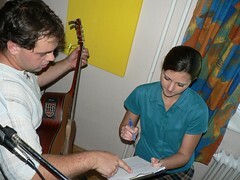 Above L: Heidi getting the song list together for Miki. 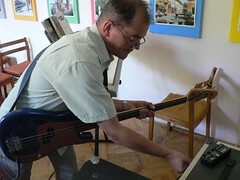 Above R: DezsÅ‘ preparing for tonight's worship. 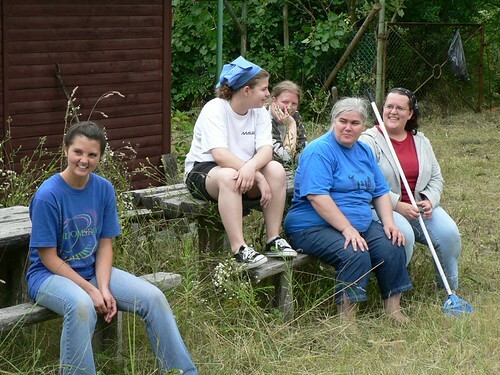 Above: Adrienn, Kinga and Feri (Márcsi in back row). Adrienn and Kinga came to worship practice on wednesday, and we prepared a choreographic dance for tonight. When I saw them outside (they live very close to our apartment), I could see them practicing the worship song. Tonight, they did a great job singing and dancing (of course I joined them). 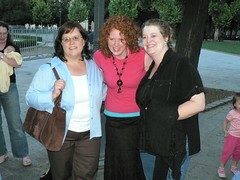 Before service, I met with Márcsi and DezsÅ‘ for more discipleship. Tonight we focused on baptism, as Márcsi will be baptized next week. Please pray for her as she prepares her testimony for Sunday and that God would bless her through this step of obedience. It was interesting to see our attendance tonight. The room seemed a bit empty, but as I surveyed the room, it dawned on me that this was the core of our church. 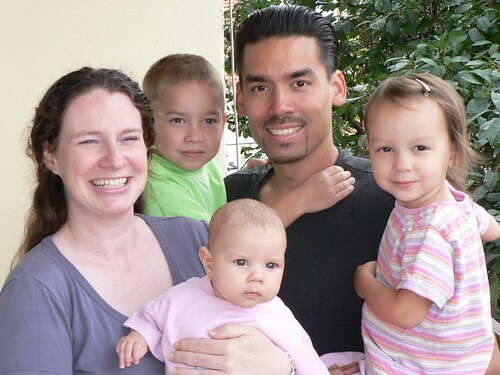 Not including the kids, we had seven people (outside of those who planted the church). I believe we have had (and will continue to have) an impact on their lives. 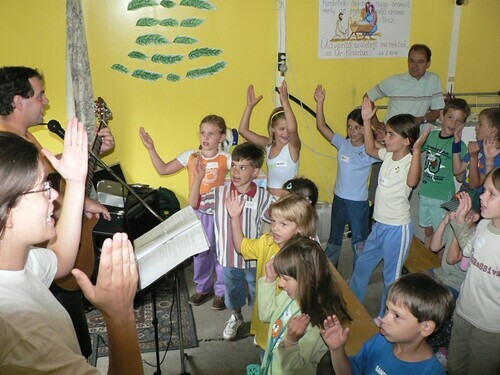 I praise God for them and for the church He is building in PetÅ‘fibánya! Above L: No, that's not our new car. 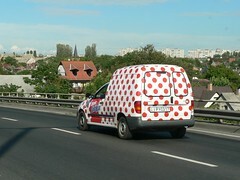 It's the Turó Rudi Mobile! What's that you say? It's one of Ben's favorite snacks here in Hungary. Turó Rudi is a type of sweet cheese that is wrapped in a thin chocolate layer. My taste buds aren't partial to it, but I grew up in America. 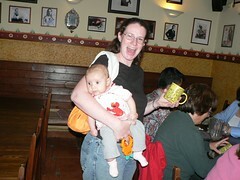 Above R: Our friend Laura and her child Micaiah. 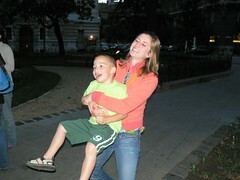 On Tuesday, we journeyed into Budapest for a visit with our friends the Mitchells. Their daughter Laura and her son Micaiah were visiting from the states, and we wanted to see Laura before they returned. Above L: Nice hair! Later on Tuesday, Sharon joined Brenda for a long awaited appointment with a highly recommended hair dresser, while Allen returned home with Ben and Elllie. 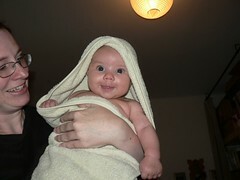 Above R: Wide eyed Kira after a refreshing bath. 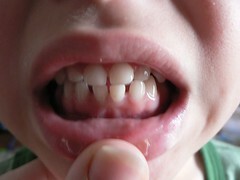 Above L: We noticed this week that Ben's two bottom teeth have decided to begin their wiggling journey out. 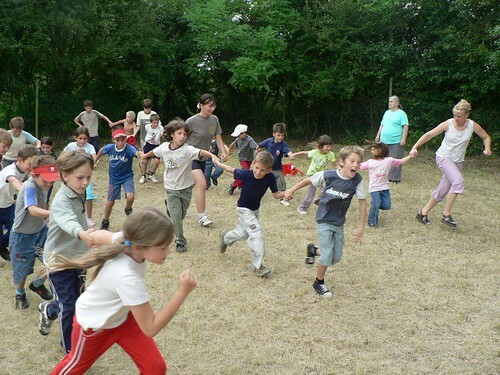 Remember that sensation when you were a kid? Yuck. 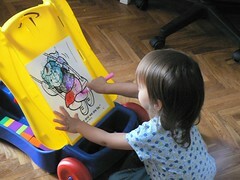 Above R: Elianna bringing to life her picture with just the right colors. Above: No, this isn't some form of discipline. This has to be one of Ben's games that has to do with castles. Above: Friday night, we gathered together for soccer. This is a great way to get to know others in town and develop relationships. We pray that these relationships will lead to them seeking to know Jesus. 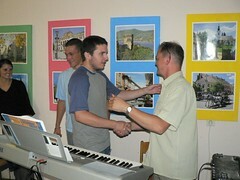 This morning, I had an opportunity to begin our first leadership training class for DezsÅ‘ with Miki's help. We are currently studying the nature and purpose of the church. It was a very edifying two hours of discussion as we read through various scripture to form a Biblical understanding of the church. We were all blessed by the time and look forward continuing our meeting every Sunday morning. Above: Miki leading a discipleship class before tonight's service. 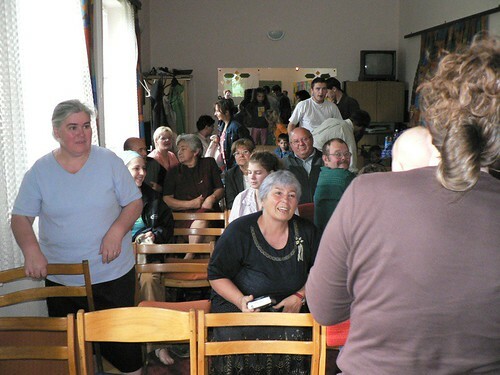 Marcsi, DezsÅ‘'s wife, (opposite Miki in peach shirt) has decided to be baptized. 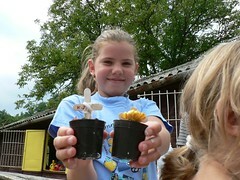 Please pray for her as she continues to grow in her faith! 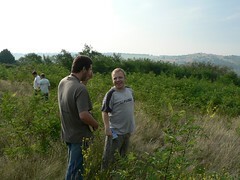 Above L to R: Pastor Máté, Dávid and Zolli. Máté is the pastor of the church we attended (and became members) while we lived in Budapest the first two years in Hungary. We were happy to have him visit us in PetÅ‘fibánya tonight. He preached about the amazing love of God and the importance of knowing Him in a relationship of love. It was clear in the prayers lifted up after the sermon that the message brought encouragement to the body and helped correct our thinking in our perception of God's love. Above L: Gabi S. fully recovered from a recent surgery that involved removing a cyst from one of his sinuses. He will be returning to the doctor on Tuesday for a follow up procedure. Please pray for him. Above R: Adrienne (brother Feri in background) and Kinga sitting in the very front row and excited to join us in singing in worship service! 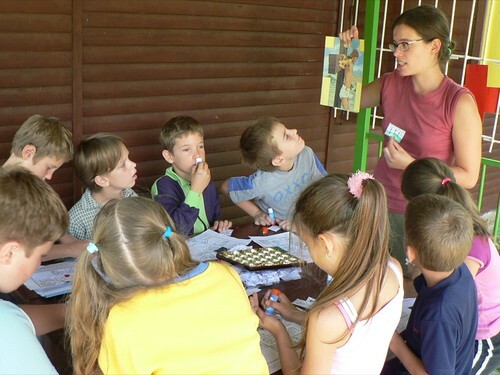 Today is a holiday in Hungary, and there were programs going on at the same time in the community center where we hold service. 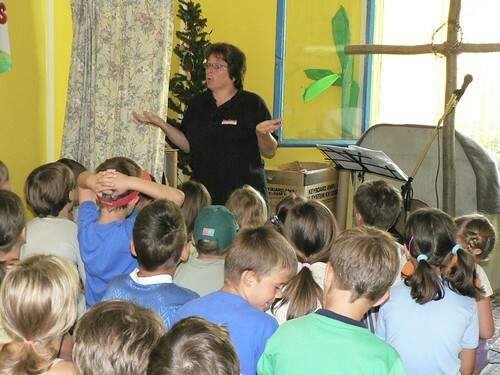 A lot of kids that were looking for the children's program that the town offered somehow found their way into our children's Sunday school with Julika. Some families peeked inside, but no new visitors stayed throughout the service. I am thankful for the coinciding holiday, as it raised the awareness of our meeting place and gave some a taste of our church. 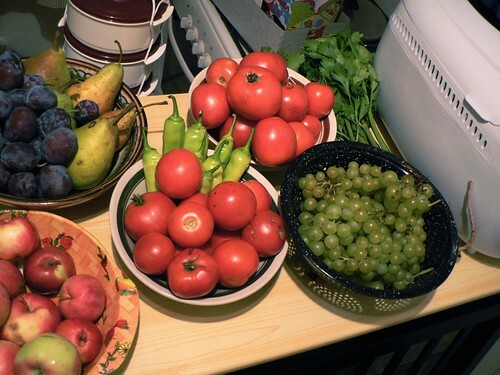 Above: The amount of fruit and vegetables we have freely received from Hungarians this week. 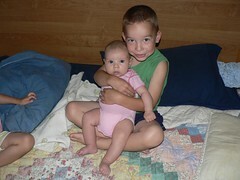 Above: Earlier in the week, Ben and Elianna had a general checkup and they are completely healthy. 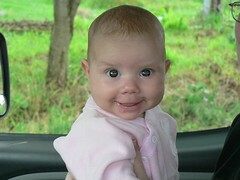 It was funny to see Elianna get a shot. I don't even think she winced (she's a tough girl). Ben needed two shots, and he also did an excellent job taking them both at once. 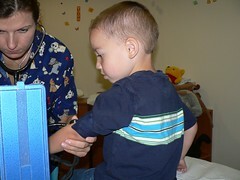 It helps the kids as they anticipate the tattoo band-aides that they receive after the shots. Above: Meeting with Gabi (L) and Dávid (R) for thursday night's discipleship study. On thursday night we talked about how God equips His children with spiritual gifts for the purpose of building up His church. 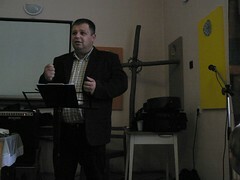 I also discussed our vision for church planting and my greatest desire to help them grow in their faith. It is my prayer that these young men mature in the knowledge of Christ and begin living out their specially designed roles in the local church for God's glory. Please pray for them. 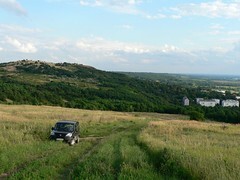 Above L: Our ministry mobile feels like a tank traveling up the steep hills in PetÅ‘fibánya. Above R: I am blessed to have the support of Miki, DezsÅ‘, Zoli and Gabi S. every morning in prayer. We travel every morning to what we call "The Mountain of Prayer" spending time in God's word and of course in prayer. We have already experienced the blessing in this time as we have been strengthened spiritually and seen direct answers to our requests. Above: Friday night sports outreach. There were lots of new faces tonight! 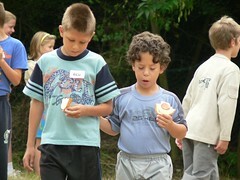 Above L: A few years ago, Oliver (above L) used to come to children's bible studies with Miki and Erika. The teenage years hit, and he disappeared. 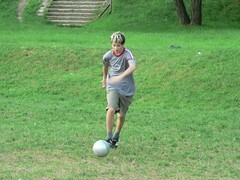 Our only contact with him is through the sports outreach. 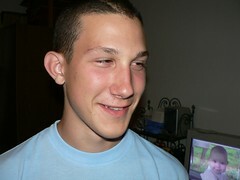 Please pray that he would have a change of heart and realize His personal need for a Savior. 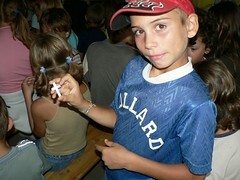 He is one of the few kids that actually was given a chance to hear the gospel as a child through Miki and Erika. Above R: Milán was saved last year, but has fallen away from our fellowship. I was thankful to see him tonight and expressed that I was not angry at him, nor did I ever want him to feel that the members of the church would be judgmental if he returned. I believe there are barriers to his returning in his personal life. Please pray for a change in his heart and an understanding of God's love and desires for his life. Above: God opened up an opportunity with the above two guys as we took a break in the shade (it is HOT here). I asked them if they believed in God. And through this question, we were led to talk about eternal life and the assurance one can have about heaven through Jesus Christ. As their curiosity was sparked, I invited them to church on Sunday. Please pray for these two young men (Bence above R-I don't know the other's name) that they would be drawn to 'check out' service this Sunday. 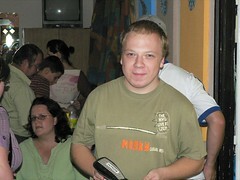 Pray also for Tamás and Béla-two other guys that I played soccer with and later invited to church. Above L: Peter preached about the importance of surrendering our decisions and daily lives to God and His guidance on Sunday. 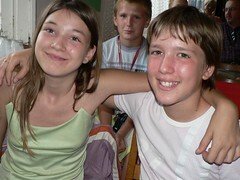 Above R: Two kids that live in our apartment building (Feri on the right) visiting church. Above L: We celebrated DezsÅ‘'s 40th birthday in church. We are so thankful to have DezsÅ‘ as a friend and to be able to see his constant growth in Christ. 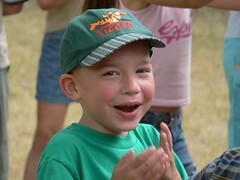 He says jokingly, "I'm only 10 years old...in Christ." He encouraged us by saying how thankful he is for our church, and how he has grown in our midst. 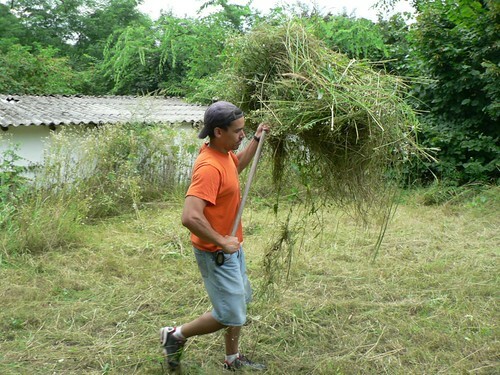 Praise God for changing DezsÅ‘'s perspective on the need to be part of a local church. Now he is praying for God to reveal his role and responsibilities in the church. 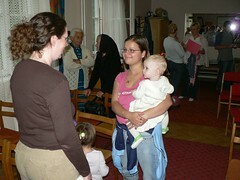 Above R: Heidi talking with Tündi from our VBS who attended on Sunday. It was disappointing that none of the parents came to church. However, I am encouraged as the word continues to spread through town of what our church is doing for the community. 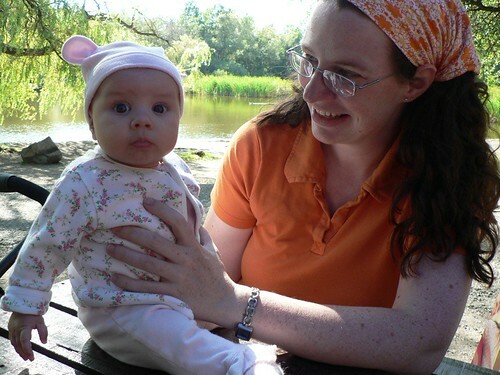 Above L: Sharon and Eszti. Above R: Daddy getting a little too close with his camera. Above: This morning, Zoli, Miki, DezsÅ‘, Csaba and I spent some time in the book of Acts and in prayer this morning on a mountain in Rozsaszentmarton (DezsÅ‘'s hometown). Above: I didn't choose the best place to park, but I did choose the right people to push. Above L: Later in the day, the sky was so beautiful, that I was compelled to drive up a mountain path in PetÅ‘fibánya to take some photographs. Midway up the steep path, I saw two people and stopped to offer them a ride to the top. They invited me to their 'garden house' in the mountain and blessed me with fresh apples and plums. Above R: Angela and Tibor's 'garden house'. 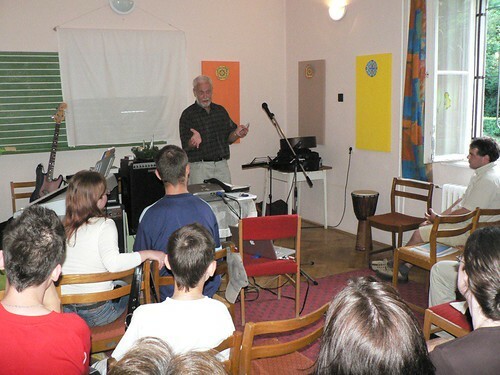 I introduced myself as the pastor of the church in PetÅ‘fibánya which lead Tibor to ask what type of church. Rather than giving him a one word answer, I explained to him what we believe. I was thankful for this sovereign appointment and pray that they would be drawn to visit our church to come to know our Savior. 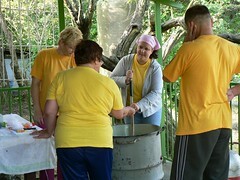 Above L: Brenda helping prepare today's special lunch-Goulash Soup! Above R: DezsÅ‘ preparing to give the thumbs up after his taste test. Above: Today we taught about the necessity of a new birth based on John 3. We had to have birthday cake of course! 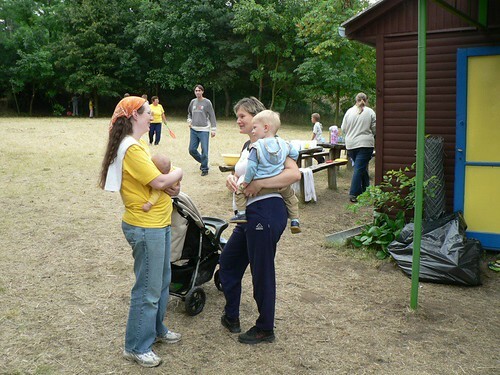 Above: We were thankful to see the handful of parents who came out to celebrate the last day of camp with their children. We held a special small group bible study on John 3 for the parents. The atmosphere was amazingly open, as people participated in answering questions related to the text. I was glad to see the balanced interaction, and the attentiveness of the parents when various members of our church shared their testimony. Please pray that their 'first time' experience with us and the power of God's word would create a new desire in them to come to church to learn more. 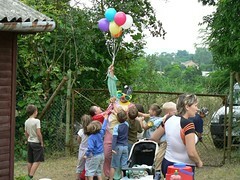 Above: Doki from Budapest was kind enough to donate a helium tank for balloons. 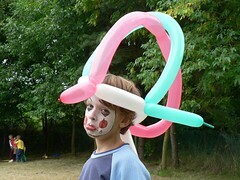 Miki was our clown for the day (not a stretch for him), and always had a crowd of kids smiling around him. 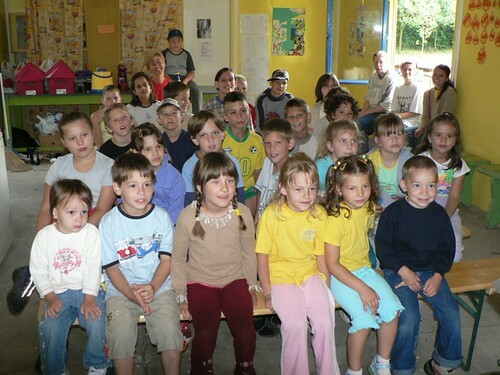 Later we showed a film of the entire week, and received many comments that they can't wait until next year's VBS. We gave out a personal invitations to church and hope to have visitors tomorrow night. 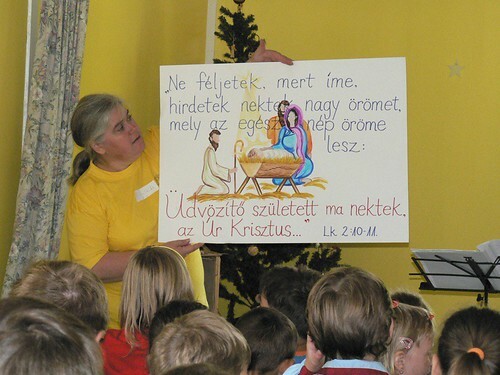 Above: Julika teaching about what happened after Jesus Christ's ressurection-His appearance to Thomas, His ascension into heaven, and His sending the Holy Spirit on the day of Pentecost. 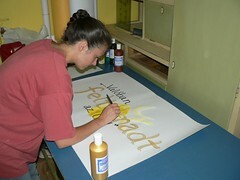 Above L: Julika teaching today's memory verse: "I am going there to prepare a place for you." 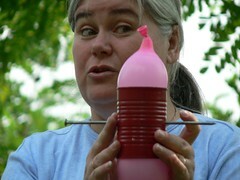 (John 14:2) Above R: Dori showing some of the crafts that will remind her what we learned throughout the week. 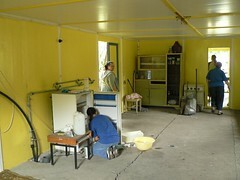 Above: While the kids are outside playing in freetime, the staff readies the room for lunch. 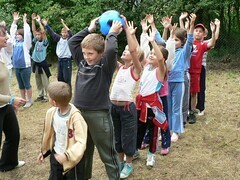 Above: The staff and children working up an apetite at game time. 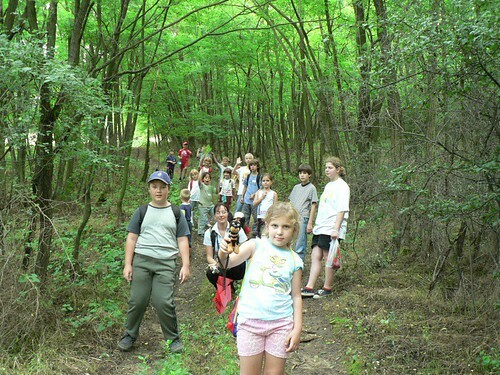 Above: Later, we took the children on a scavenger hunt in the surrounding forrest. We had a great time exploring God's creation together. Above L: Can you find the things on this list (can you understand anything that Heidi wrote?) Above R: A beautiful day for the scavenger hunt. 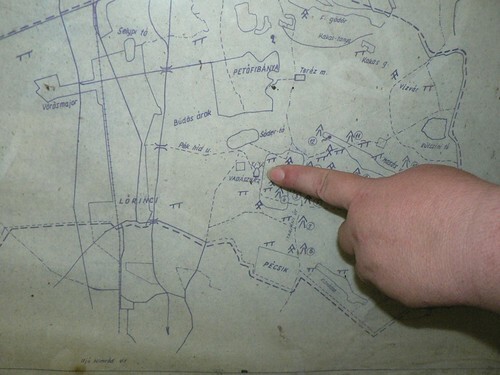 Above: Julika pointing out a nearby mountain that may resemble the mountain where Jesus ascended into heaven. Above: Giving an illustration of how being in Christ protects us from the destruction caused by sin. 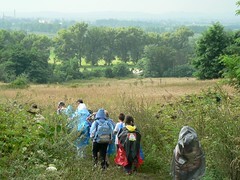 Above: As we made our way back from the 'lesson on the mount', we began hearing thunder. We quickly made our way back to the cabin before the rain came. 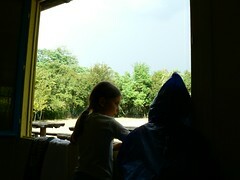 Unfortunately, just as we were ready to hike back to town with the kids to meet their parents, it began pouring. We quickly rushed inside, and Miki led a great time of singing. Less than 10 minutes later, the storm completly cleared up and we were able to walk home in the sunshine (see photos below). 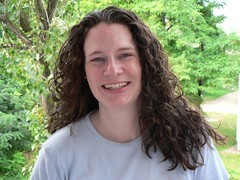 Above: Our teammate Heidi's landllord 'allowed' one of her children to come to camp with us last minute this year. I was able to meet this child's brother who rode up the mountain with a friend to pick her up today. I was able to get one of their phone numbers and will be inviting them to our Friday sport's outreach. Tomorrow we will have our final day of camp where we will teach about the necessity of a new birth. Parents have been invited to join us on this day, and we will be holding a small group for them as well where we will study John 3 together. • Miki is still suffering from a sinus infection. He attempted to see a doctor today, but the doctor was out. Please pray that he would be healed. • Parents will be attending tomorrow. Please pray for the small group time where we will be studying God's word together. Pray that I would have wisdom as I prepare and lead tomorrows study. Many of these parents have never heard the gospel or stepped foot into church. • Pray for good weather again as much of our day will be spent outside. • Pray that we would be able to connect with parents and that they would choose to join us in church on Sunday. 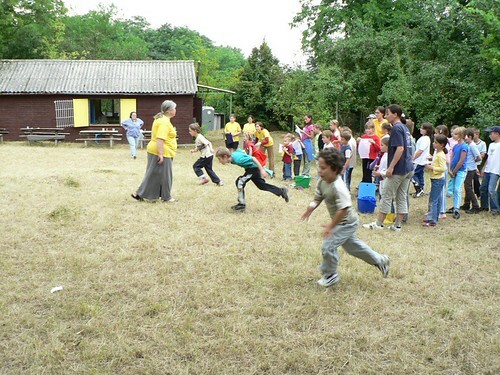 • As always, please pray for physical strength and for a good night's rest tonight for all the staff (and kids). 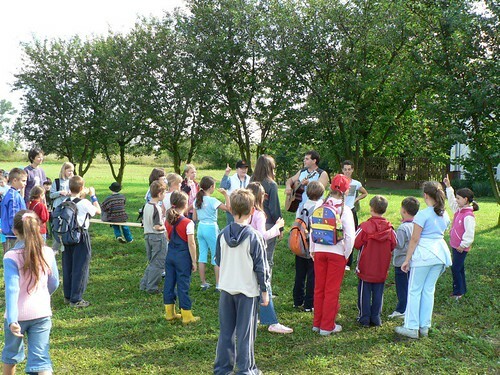 Above: Miki and Janka leading singing time. It is great to see the kids joining in and singing words from memory! Above: Julika reviewing this week's lessons before getting to one of the most important events in history. Above: Val was able to share her testimony today about how she was saved at 8 years old. 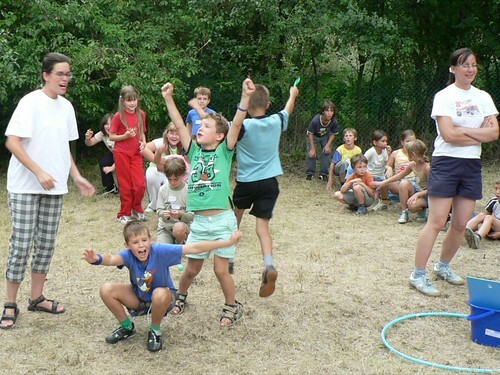 Above: We praise God for helping the kids with behavioral problems develop friendships. 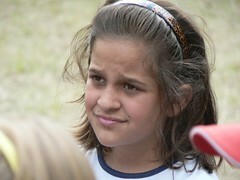 We saw a drastic change again in behavior and only had minor issues that worked out after talking to the kids. 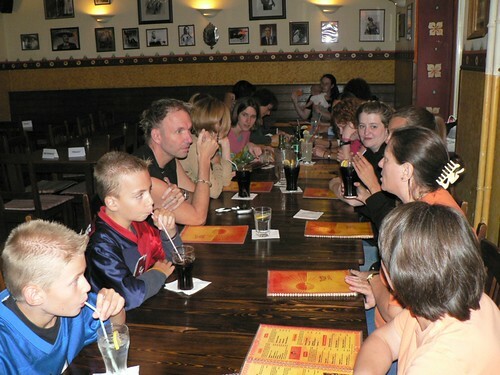 We are glad to see such a mix of kids from different backgrounds and age groups bonding together. Above: Janka's small group learning about our burden of sin and the only One who can save us from it. 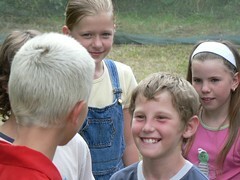 Above L: Tamás (in blue shirt) surprised Janka today when he told her that he believes in reincarnation. 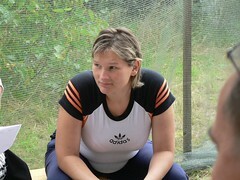 Tamás' mom told Janka previously that she practices yoga with her son. She is very open to spiritual things, and 4 years ago spent time with Miki and others in a small group setting. 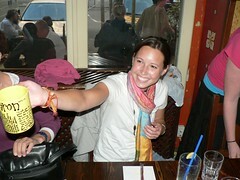 Soon after, she no longer attended because of various reasons. 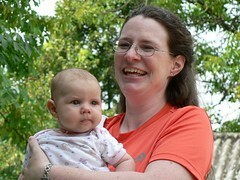 We are thankful that we are able to reconnect with her and her son through this camp. Please pray they may hear and understand the claims of Jesus Christ as the way, the truth and the life. 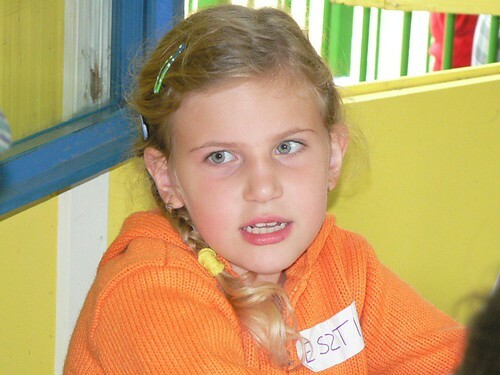 Above R: Zsofi said that she has never heard about what we are teaching the way that we teach it. This may mean that she has some kind of religious background, but not understanding. She seems to be thinking deeply about the things that are being discussed. 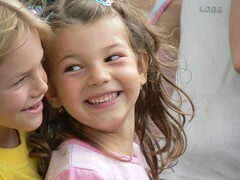 Her mother recently told Miki that she is looking for a group of people to call friends. Please pray that through this camp they may find fellowship in our church. 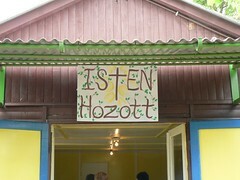 Above: Eszti had a conversation with Moni and Heidi today that was encouraging. Eszti said that she just didn't know whether to believe or not believe in God. She said she was confused and thought the solution was to choose 'the middle'. 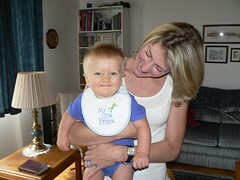 Heidi explained that there is no middle ground, but rather we believe or we don't. 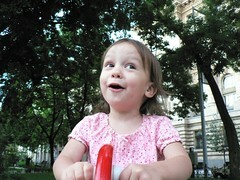 After thinking for a moment, Eszti said, "well then I believe." 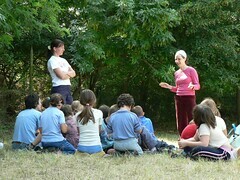 Above: Kriszti and Naomi's small group. Above: Julika stopped by Miki and Erika's small group just in time to hear some interesting questions being raised. "What happens to our bodies after we die?" "What happens after we die?" "How can I get to heaven?" "What is heaven life?" This was a great opportunity, and she was able to give Biblical answers to hearts that are becoming more hungry for the truth. Above L: Sharon and Kira making their daily afternoon visit. 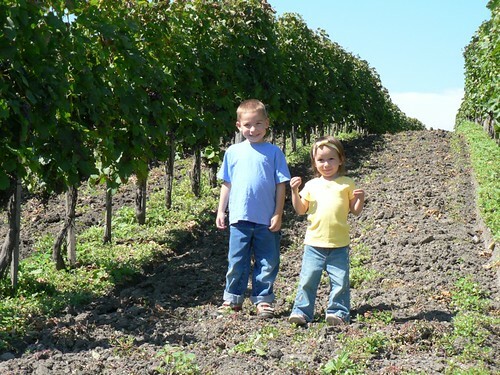 The kids (and the workers) love to see Kira. I don't mind so much either :) Above R: Heidi and Elianna swinging jump rope for the kids. 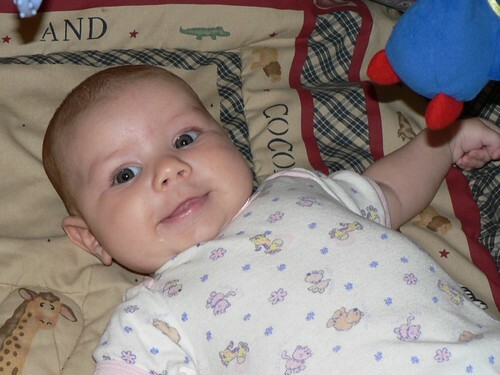 Above: Elianna practicing for a star role in a Motorola commercial. Above L: Every day we exchange cards with encouraging words that the kids and teachers make at craft time. Above R: Ben being attacked by the tickle monster. Above: God has been gracious again to provide beautiful weather for game time. 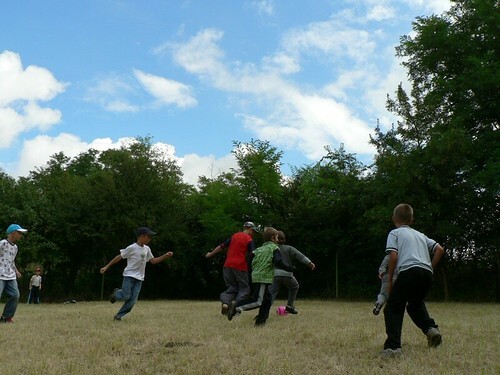 The kids have been competing all week in teams, collecting points each day which will be revealed on the last day. Above L: Just as we finished our last game, the rain came! As we sung songs inside and had our evening snack, it poured. 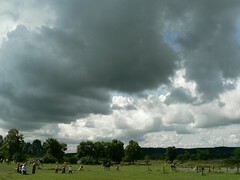 As the kids got ready to leave, the rain clouds moved away. By the time they began their journey down the mountain, the sun returned. Praise God for His perfect timing. 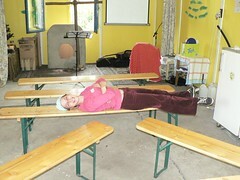 Above R: Naomi resting a bit before our evening staff meeting. 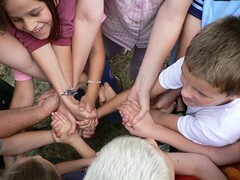 We are nearing the end of camp and need your continued prayers! • Teenager Gabi's surgery went well today. He is recovering and should be released tomorrow to return home. • Miki was fine most of the day, but at the end of the day, His sinus infection returned. Please continue to pray for him. • All the workers continue to have physical strength by God's grace. Please continue to pray for more strength in these final days. • The kids with behavioral problems didn't really have problems today! Please continue to pray for them. • Good questions continue to be asked and many of the kids are continuing to seek for truth. 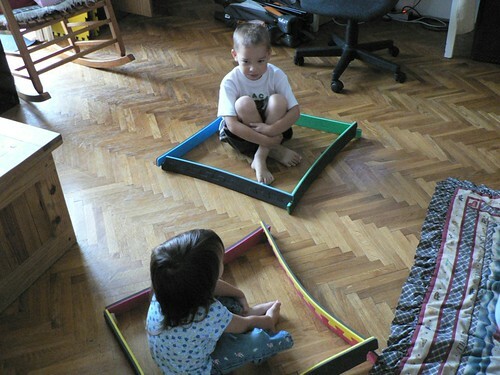 Above: Janka and Miki beginning our day with some of the kid's favorite songs. One of the kids said in his small group that he couldn't stop singing one of the songs after he returned home last night. 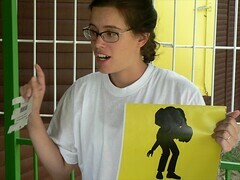 Above: Julika dramatically told the events that led up to Jesus' crucifixion and death. It was awesome to see that the kids payed attention to over 30 minutes of teaching and later brought up related questions in their small groups. Above L: Heidi's artistic poster showing today's memory verse. 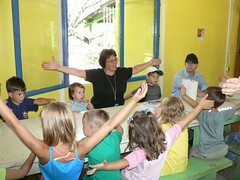 Above R: Val helping the pre-school kids memorize the verse with motions. 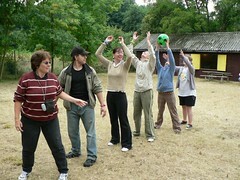 Above: Miki and Erika's small group. 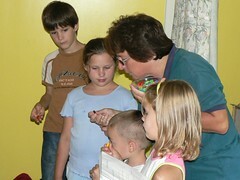 Miki said that two of the kids were very engaged in the explanation of the gospel today and prayed with him afterwards. 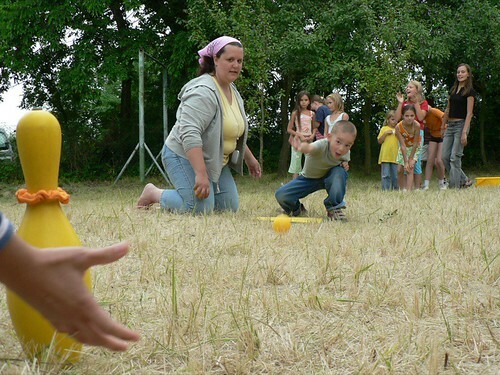 Above L: Brenda and Heidi having fun with the kids at game time. Above R: Heidi sharing her families holiday traditions. 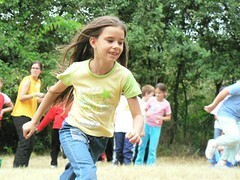 Above L: Miki's daughter Anna enjoying game time. Above R: Rosy faced Ben joining in on the fun. 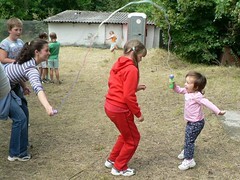 Above L: Julika showing the kids how it's done. Above R: Brenda tending to some more mild injuries today. 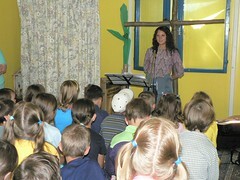 Above: Heidi, Janka and Miki end the day with a drama presentation of the gospel. We continue to see a softening of hearts and some of the kids asking more questions about Jesus and eternal life. 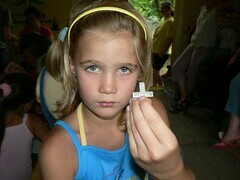 Above: Before leaving today, the kids were given crosses with the words "God loves you" written on them. 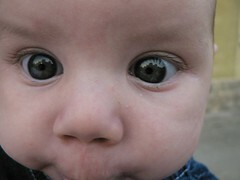 I was impressed with my son Ben this morning as Julika explained the gospel. When she said, "Jesus died so that we could be forgiven our sins and have eternal life". Ben blurted out, "But not everyone, but not everyone..." This lead Julika to remind the kids of the need to personally receive the gift of God's grace through faith. Those who don't receive this gift by faith have no hope after death, but the reality of hell. 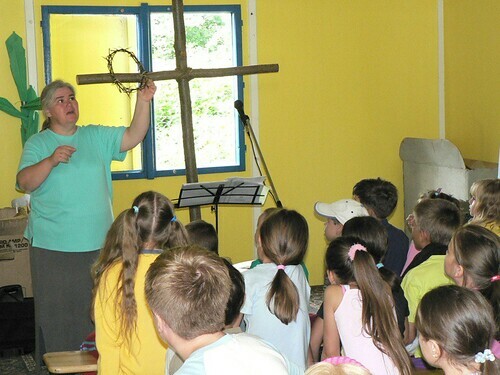 The cross that we gave the kids reminds them that God has revealed His love to them in the most powerful way. It will be their choice to receive Him or reject Him. Please pray for their salvation! 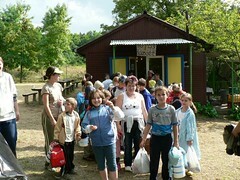 Other news: The lunches in our camp are supplied by a local restaurant. One day while Miki was picking up the packaged lunches, the owner informed him of his child being sick. Miki prayed for him and today had an opportunity to ask how his son was doing. He was better. The owner was so impressed with our camp (through second hand sources) that he said to Miki that he wants to support us next year financially. He also said that he would call a few of his other friends who own businesses to get more support. This was a complete surprise to us that encouraged our hearts. 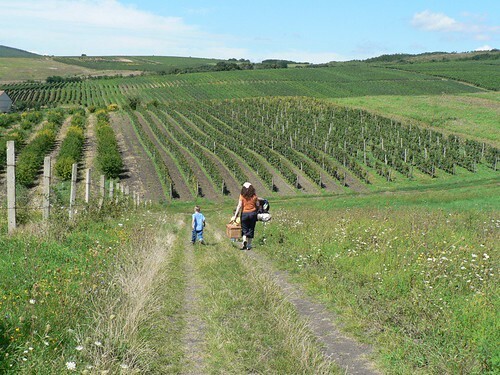 Moreover, the owner said that he would like his own son to attend next year. When Miki asked if it was a problem that he prayed for the owner's son the other day, the owner said, "Not at all!" 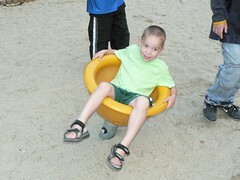 We are amazed at the ways God is working beyond the boundaries of the children's VBS grounds. As I stated yesterday, two of the camp helpers from the town of Selyp have developed an interest in a Bible study through serving with us. And today the restaurant owner is willing to support a Christian camp after two days of interacting with Miki. 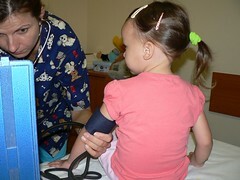 We hope to see more amazing breakthroughs in the children's hearts in the next few days. 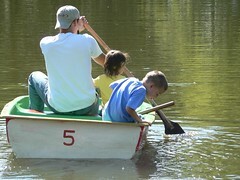 And we also hope to see parents come to know Jesus through this Saturday's open invitation day. • Nori's fever continues to come and go. Please pray that she would be completely healed. 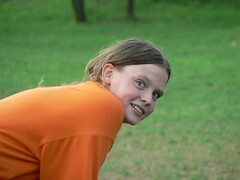 • Miki has a sinus infection that causes serious pain. • All of the workers are 'pushing the limits' physically and we could benefit from a good night's rest and strength tomorrow. 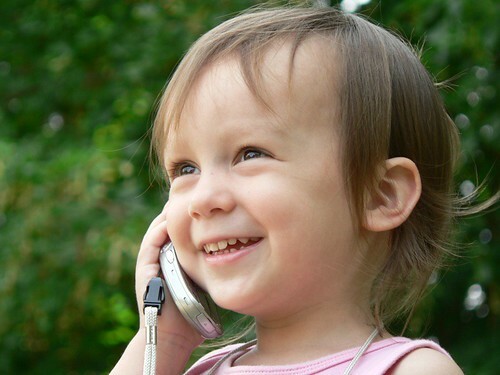 • Pray again for the kids who have behavioral problems that this would not be a barrier to their hearing and understanding the gospel. Also that they would not be a distraction to the others. • Continue to pray for just the right weather (today, rain was forecast, but God gave us a perfect sunny day). 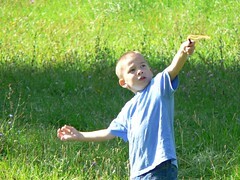 Many of our activities are outside. • Pray for those who's hearts are being softened to take more steps to finding out what it means to be saved. • Pray for the teachers that they would have wisdom when presenting the gospel. 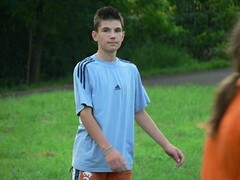 • Not related to VBS but important- Gabi S. (teenager) from Petôfibánya will be having surgery tomorrow. Please pray for him. He is expected to be able to come home on Friday. 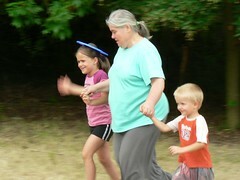 Above: Today for VBS, we traveled to a horse ranch 30 minutes away. We praise God for a beautiful day! 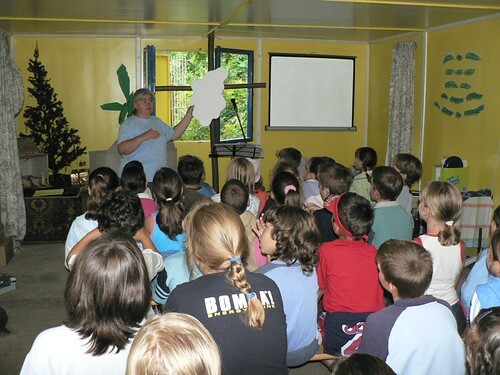 Above: Julika explaining the meaning of Palm Sunday. In the midst of today's teaching, one of the children asked, "How does Ben know all the answers." Julika explained that his parents read the Bible with him at home. 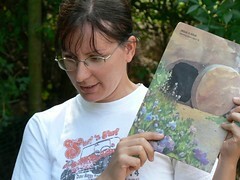 Another child said, "I don't have any books about God at home." It was clear that he had a desire to know more, but no opportunity. We praise God for sending us to give him that opportunity. When he returns home from this camp, he will now have a Bible to read at home. 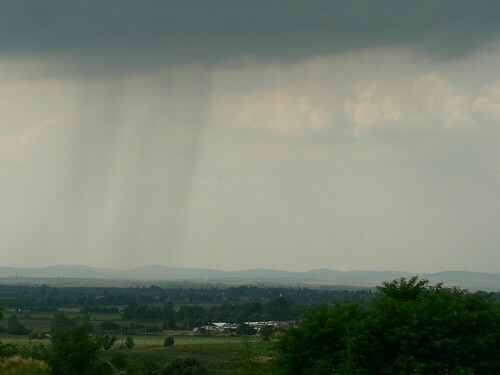 Above L: God holding back the rain. Above R: Kira excited by a surprise visit from daddy. Above: After returning to the cabin in the mountains for lunch, we finished the day with songs, games and the gospel presentation by Val (above L). She used chocolate M&Ms to illustrate how different we are on the outside, but we have a common darkness on the inside that separates us from God...sin. We were thankful for the way the children payed attention to the gospel, and hearing that one must receive the gift found in Jesus Christ rather than ignore or reject it. 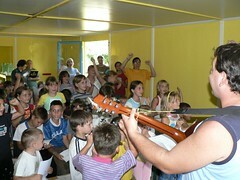 One of the pre-school kids (who is related to Miki), said, "I feel something good in my heart when we sing these songs." Above L: We were thankful for a greater sense of connectedness the children are feeling. We also praise God for giving wisdom and help with those who were extremely rebellious yesterday. 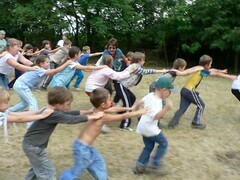 Today, they responded to first warnings and enjoyed being part of games and activities rather than opposing them! Above R: Gyöngyi, who is helping us in camp, is from the neighboring town of Selyp. She is not a christian, but interested in finding out more. Miki was encouraged to hear that Gyöngyi and Anita (another helper from Selyp) would gladly welcome and participate in a Bible study if we offered one. Anita is already saved and visits our church frequently, however it is difficult for her to walk a few miles with 4 kids to our service. Please pray for Gyöngyi and for wisdom for our focus group team as we seek God's direction in knowing what steps to take in church planting beyond Petôfibánya. 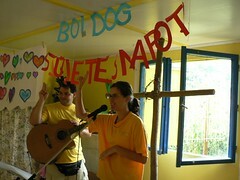 Please continue to pray for this VBS. As you can see yesterday's requests were answered. 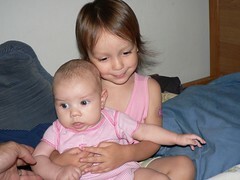 Please pray for Janka's sister Nori who has a high fever. Please continue to pray that we would have appropriate weather for camp. Pray also for our teaching about the resurrection tomorrow and the gospel presentation. 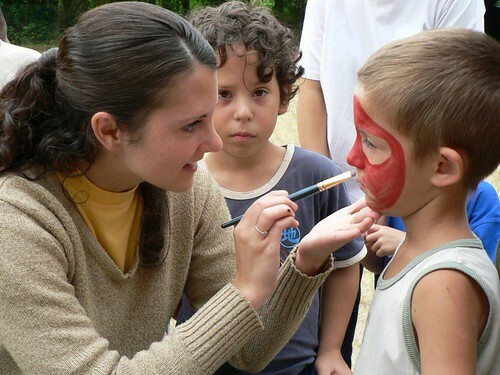 Pray that God would give these children understanding and draw them to Himself. Pray that He might use us to display His love. Above: Our daily meeting point-the local community center with all of it's communist flair. 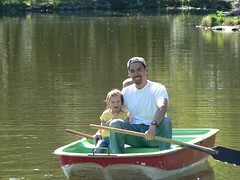 After the kids signed-in, we took the 30 minute journey to the cabin in the mountains. 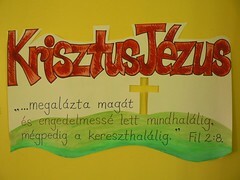 Above L: The literal translation is "God brought you"-which Hungarians use for "welcome!" 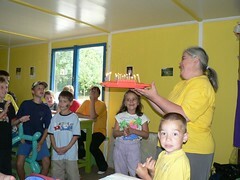 Above R: Janka (a key person in planning and carrying out the VBS) helps lead a time of singing. 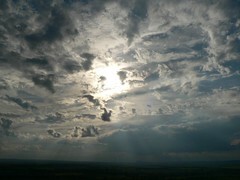 Above: It was a mixed day of rain and sunshine. 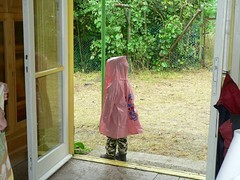 We are thankful that the kids were able to play outside for game time and we were able to teach them while it rained. 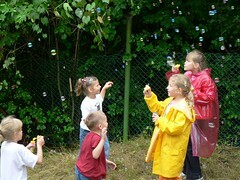 Above: After the rain stopped, the kids had some fun with bubbles. 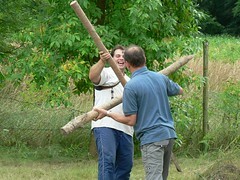 Above L: Fun and games related to today's teaching. Above R: Unfortunately we had a few who were injured or sick today. Thankfully 'nurse' Brenda was prepared to comfort them and tend to their needs. Above: Heading back home for the day. This is the mud that my vehicle was stuck in for half the day. 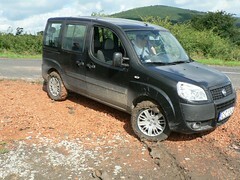 We praise God that the sun came out after 4:30 pm and began drying up the ground just enough for my vehicle to escape. 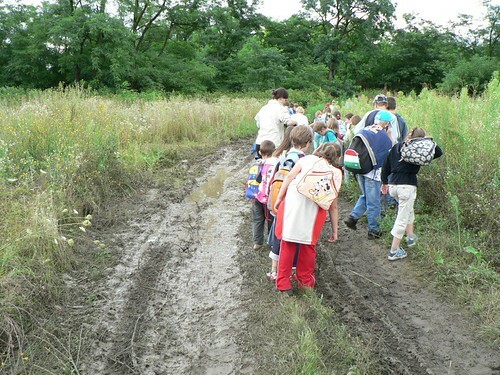 We praise God that all the essential things we needed for camp were able to be delivered on the muddy roads. For example, lunch would have been a disaster if we couldn't make it up the hill in the afternoon. But God was faithful to provide for our needs. In our daily meeting afterwards, we talked about how many of the kids had a disregard for the leaders.Thankfully, this is not the majority of kids, but also not a small number. Many of the kids curse, and in the free-time we appointed, they were close to beating each other up. Once again we are confronted with the effects of sin and the consequences of families that are in need of Jesus Christ. 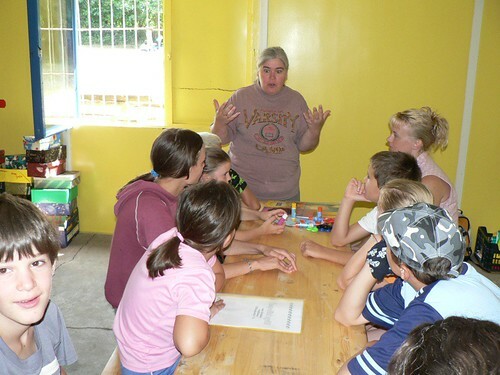 Please pray that behavioral problems would not become a barrier to developing relationships with these children and leading them to know His love and leadership. 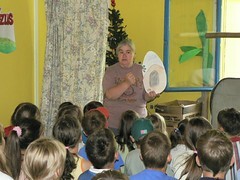 It also became evident that many of the kids were hearing the true meaning of Christmas for the first time. Please pray for these kids to be filled with understanding this week, and to come to know the reason we celebrate! 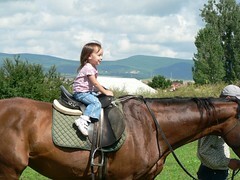 Tomorrow, we will take a day trip to ranch where there will be horse back riding and times of teaching and games. 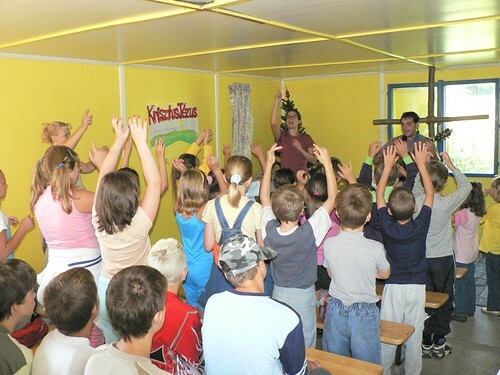 Please continue to pray for this VBS! Above: We had a full house tonight, with visitors from the neighboring town of Selyp, from Budapest and other areas. 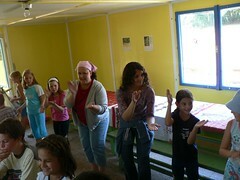 Some of them will be helping in our VBS (starting tomorrow). Above L: These two girls aspire to be singers in our worship group. They come every Sunday one hour early to practice with us. 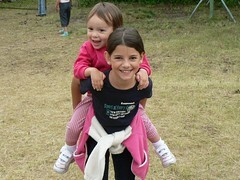 Above R: Norbi and Lidia. Lidia has decided to be baptized and continues to grow in her faith. 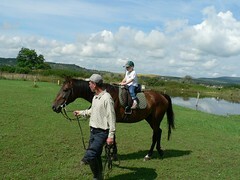 Norbi (her boyfriend) has recently 'rejoined' our fellowship and is taking wise steps. 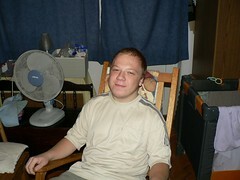 Please pray for him to have spirtual understanding, that He would love Jesus above all. 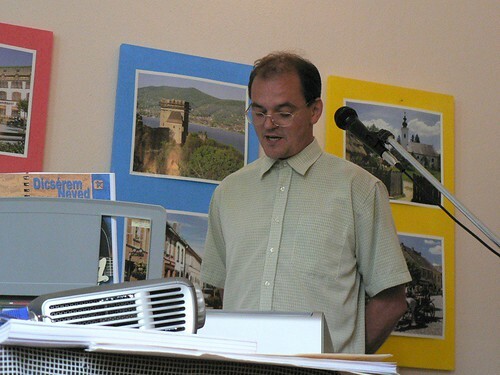 Above: Our friend György Kovács preached from the book of John. We are thankful for God sustaining him (he was diagnosed with cancer last year) and for using him to bless our church tonight. Please pray that he would be completely healed of cancer and continue to be used in a church planting movement throughout Hungary. 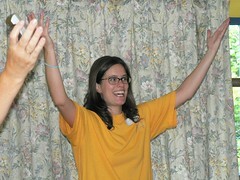 Above: Church member Dezsô continues to be overwhelmed with God's truth and grace. He was moved to share tonight about the contrast between God's wisdom and the worlds 'wisdom'. I am thankful to see him taking steps (while he trembles with fear) to share what God has been teaching him to the church. Please pray that Dezsô would continue to be built up by God's word and continue to use his giftings to build up the church. 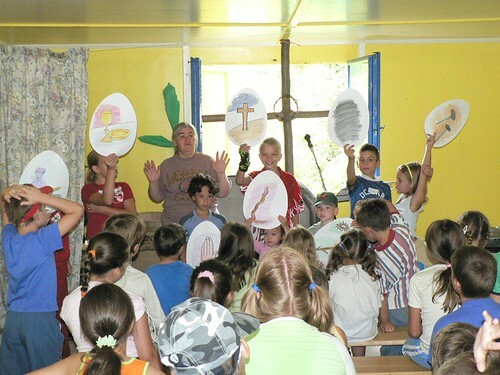 Tomorrow is day one of our VBS in PetÅ‘fibánya! Please pray for all of us who will be serving and the 48 children who will attend. Above: Kate, Katie, Emily and Ashley from the EDGE team (short term missionaries) treated our entire team to a great farewell dinner at one of our favorite restaurants. We are thankful for the giftings and blessings they brought to our ministries over the summer. We will miss them! Above: Kira hanging out with daddy. Above: The EDGE team prepared special coffee mugs for everyone with personal notes of thanks and encouragement. Above: After a filling dinner, we walked out to the park with the kids. Above: Saying our final goodbyes to the EDGE team. 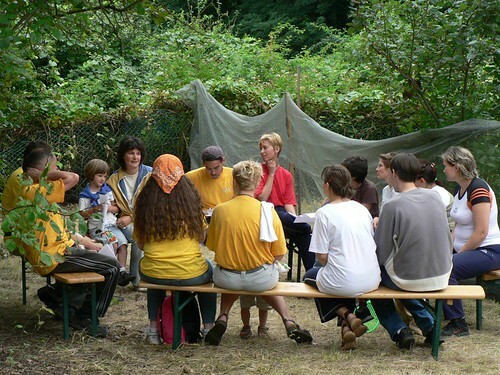 Above: Meeting together for a time of reading God's word and prayer. Above: So, what did you do all day? The picture above explains it all. 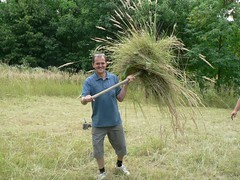 While Miki sliced and diced the shoulder high weeds, Dezsô and I continued clearing the grounds. Dezsô, who struggles with allergies, was praising God for being able to work in dusty, dry cut grass all day without a problem. I also smiled when considering how many times I sneezed today-NONE (I used to struggle with allergies as well, until God healed me). We praise God for once again holding the rain off the entire day. Instead, there was just enough cloud cover to keep the working conditions cool. 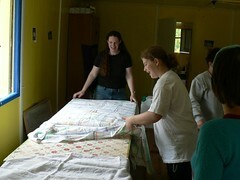 Above: Inside, Heidi (left), Julika (right) and the others continued cleaning and preparing the crafts for VBS. 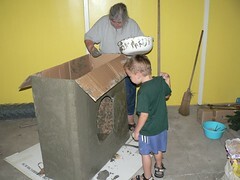 Ben also had a hand in helping Julika prepare the tomb (above) for the story of the resurrection. 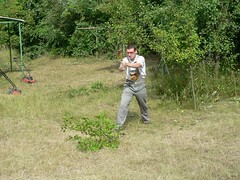 Above L: Zealous Zoli helped again today, trimming tree limbs with his trusty axe. Above R: Christmas tree? 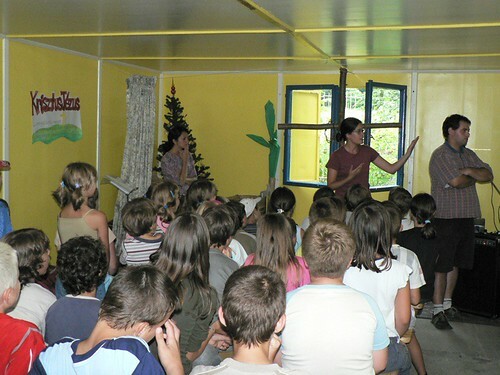 This will be our first celebration next week with the kids in VBS, as we deliver the true meaning of Christmas. 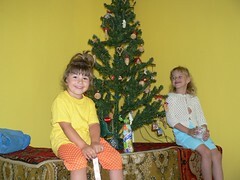 Dezsô's kids, Betti and Adrienn had a blast helping decorate the tree. Above: Ahhh, a refreshing sight after a long day's work. Open field, and a clean cabin! 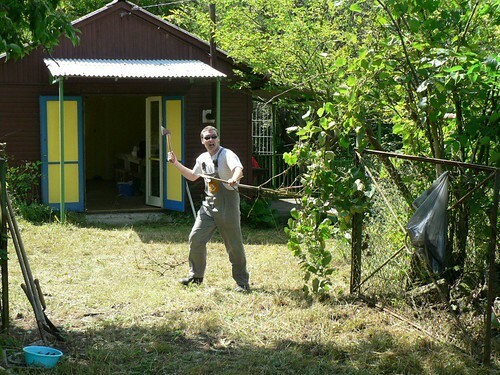 Tomorrow we will finish off the weeds in the back of the cabin, and make final preparations for VBS. Please pray for us! 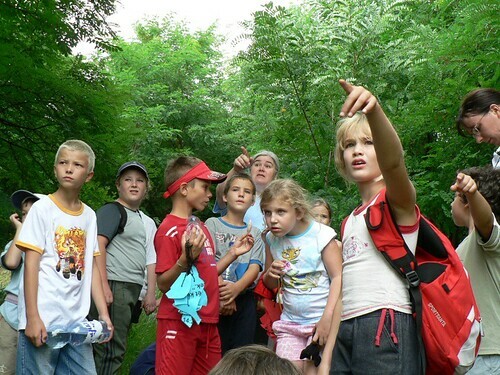 Above: Julika showing our location for a day of preparation for our upcoming VBS camp. If you look directly above her finger, you will see our hometown Petôfibánya. 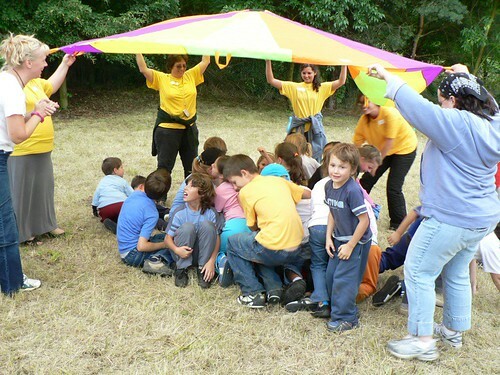 Above: We literally had to cut our way into where we will be holding VBS. We first had to break a rusted lock off the outer gate. 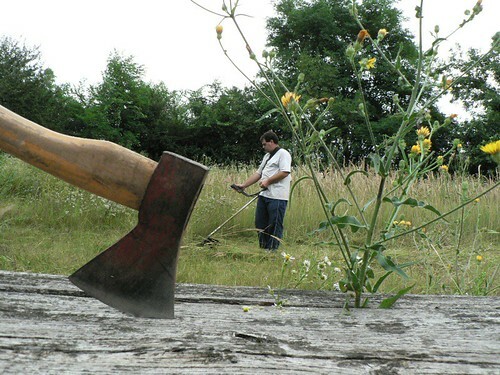 Afterwards Miki created a path with a weed-wacker for the others to enter the cabin to begin cleaning. Above: We kept our distance from teenager Zoli as he helped us by chopping down stray branches. Above: While Miki, Dezsô and I tackled the gigantic weeds outside, the others battled spiders, wasps and months of dust and dirt build up. Above: Janka and Dezsô adding to a mound of weeds that we will burn later in the week. 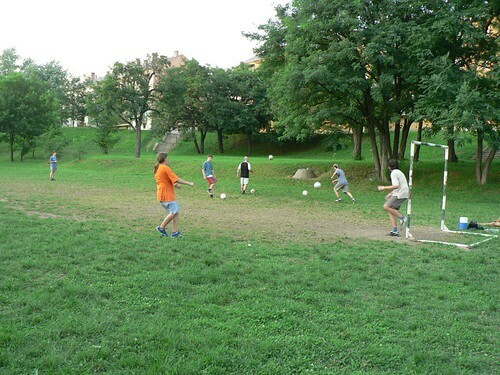 Above: As if Miki and Dezsô didn't have enough strenuous activity! 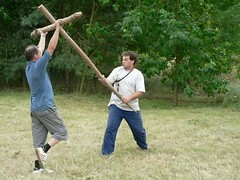 Ready your log for battle! Above: Taking a break after a long day's work. 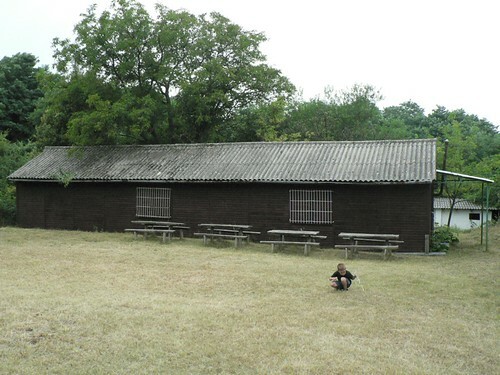 We are thankful that we received this property to use for free for this years VBS (our first in Petôfibánya). Last night it began pouring rain, and we praise God that this morning the rain had cleared out allowing for us to prepare this property the whole day! 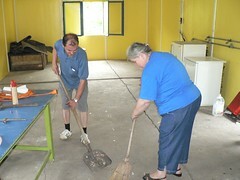 Please pray for us as we will continue cleaning and preparing for next weeks VBS.